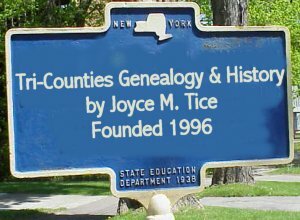 by George A. Retan, Ph.D.
INTRODUCTION The history of the first settlements in what is now Mansfield has been detailed in several other histories. Since no other sources for this period are available, it has been deemed advisable not to repeat this material in this history. The sources of the first fourteen years of this history have been the minutes of the Borough Council which are complete for the full one hundred years. Beginning with 1873, a date which is incorrectly given as 1874 in some histories, the files of the Mansfield Advertiser are complete except from 1911 to 1929. The files are again complete from 1930 to date. The files of all the early years bear the name of O. Newell and we owe him a great debt for saving these papers and presenting them to the Library. 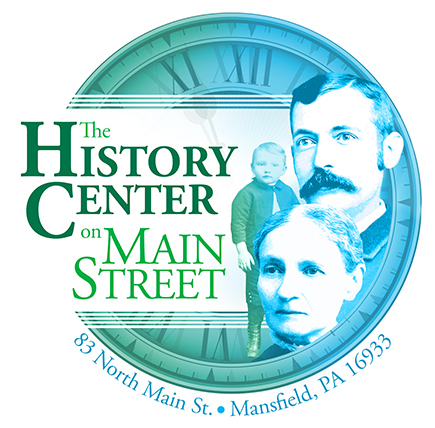 A contributor to the paper in 1887 relates that in 1831 there were, in Mansfield, fourteen dwelling houses, a hotel, a school, a saw mill, a wool carding mill, a tannery, a shoemaker, a blacksmith shop, a wagon repair shop and two stores, one near the four corners, and one on South Main Street near First Street. There were large pine stumps on each side of Main and Sullivan Streets. One copy of "The Balance," a paper published in Mansfield in 1855, is owned by Mrs. Margaret Knapp. This was an organ of the "Good Templars" with I. M. Ruchman as editor. His wife was prominent in the national organization and her contributions are about all that is in the paper. There were no locals, but the following people advertised in the paper: H. G. Martin, Drugs; Wm. Hollands, Harness Maker; J. S. Hoard, Brick Yard; Amos Bixby, Plaster, Paint and Lime. The personal cards were: Henry Allen, Lawyer; C. V. Elliott, Doctor; O. H. Phelps, Travellers’ Home, a temperance house. Three general stores; G. M. Bailey, L. C. Holden, A. J. Ross; Drugs, Henry G. Martin; Harness Shop, Wm. Hollands; Tailor, A. J. Howell; Wagon Maker and Undertaker, R. P. Buttles; Bibles and Testaments, J. S. Hoard; Hotels, O. H. Phelps and the Fuller House; Grist Mill, C. W. Bailey; Blacksmith, Aaron Baldwin; Wagons, Charles Hammond. The Doctors were J. P. Morris, C. V. Elliott and Wm. M. Barden. 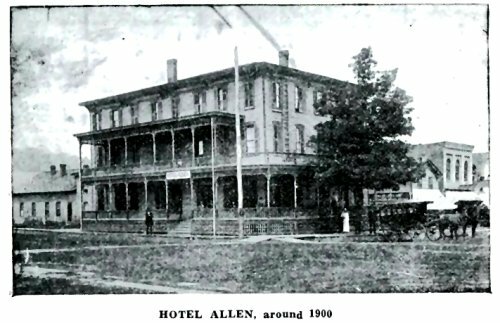 The Lawyers were Henry Allen and Wm. Adams, J. P. Morris also had an Iron Works. There were two churches, Baptist, in its present location but a wooden building, and the Methodist in the building now occupied by the Adventist Church. In 1855, there had been a paper, THE BALANCE, and later for a short period, THE MANSFIELD EXPRESS. A map, apparently copied from the first official map of the Borough, which had been made in 1857, has been found by Budd Clark. It seems to have been made by M. L. Clark. It shows the Railroad Station on the north side of West Elmira St. On the west side of N. Main Street from the corner wee: H. Klas, Nesbit, C. V. Elliott, alley, Buttles, shop. A. Baldwin, H. Allen. On the east side were only Vorhees and Ross. Between Elmira Street and Corey Creek were Barden, M. L. Clark, J. B. Clark, H. Shuart, C. V. Elliott, B. M. Bailey, Wm. Ingalls and R. Davis. On Elmira Street were H. Lawrence. D. C. Spurs, Lamb, Slingerland. L. Beach was where the Arts Building now is. 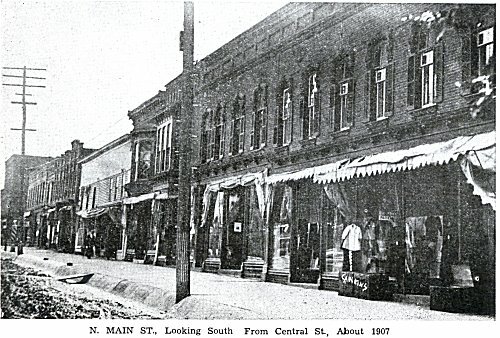 On S. Main Street, east side, were Hoard, Hollands and P. Williams. Mart King was south of Corey Creek on the west side. L. Holden was on W. Wellsboro Street. L. Cummings was on East Wellsboro Street. On November 28, 1856, fifty-seven citizens petitioned the Court to set up Mansfield as a Borough. On Feb. 13, 1857, the Grand Jury of the County certified that the conditions demanded by the laws of the State had been met and March 27th was set as the date of the first election of Borough Officers. The Grand Jury appointed A. J. Ross, Judge of Elections and L. Beach and S. B. Elliott as Inspectors of Election and J. S. Hoard, Clerk. The election was held at the home of O. H. Phelps. The following officers were elected: Burgess, Henry Allen; Councilmen, Peter Gaylord, L. H. Elliott, J. M. Casselle, H. Davis and Marcus Kelly. From the map of M. L. Clark, and from the official map of 1875 which is still in existence, and from the specified lines in the Charter of Incorporation, the boundaries of the original Borough can be roughly determined. The southern line was a little north of what is now First Street. The northern boundary was a little north of what is now Prospect Cemetery. The western boundary was the Tioga River to near the mouth of Corey Creek, then east to the railroad and along the railroad to the north line. The eastern boundary was approximately as at present. The land comprised within the Borough was originally held by three estates: Asa Mann, who purchased from John and Peter Kelts; the J. P. Morris Estate, which purchased the residue of the Mann lands sold at Sheriff’s sale; The Holden Estate. The original Mann lands are, roughly the business section; the J. P. Morris lands those west of the Railroad and some lots in town; and the Holden lands were those east and south of the Mann Tract. The streets mentioned in the minutes of the early meetings were: The Williamson Road; Sullivan Street, east of the corners; Wellsboro Street, west of the square; Elmira Street and road; Church Street, now Sherwood; and Seminary Street, now Academy. The present College Avenue is shown on the map, but not named. Much of the Borough, more than has ever been settled was at once laid out in lots. Some of these old lot maps, probably copies of the original, are in the possession of the Council. 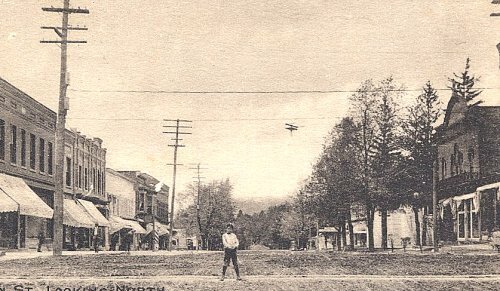 North Main Street, Looking North from Wellsboro St., About 1907.